Residential Life Officer Lucy Atkinson and UEL Journalism student Lucas Ribeiro dos Santos look back over Week 7 of life in halls. Hi and welcome back to #LivingYourBestResLife. This week we had some very chilled events to take the stress out of your daily essays. We started this week with Karaoke Open Mic. The amount of talent we see during those nights is unbelievable (unlike myself who is scared of singing in public). Some students came in and sang their hearts out while others just enjoyed some good old snacks. To anyone who didn’t show up, I say don’t be shy, come on down next time. The Karaoke Open Mic crowds are very nice and friendly. Now for those of you who know me, you know that your boy Lucas is a huge nerd. My nerd dreams came true with Movie Night showing the best possible movie – Avengers: Infinity War! I had to tell my friend to keep getting me popcorn and sweets, as I did not want to look away from the screen for a second. Absolute masterpiece with all the superheroes that we know and love trying to save the universe from the mad titan Thanos. Let me stop talking about it or I will start giving spoilers. Movie nights are my favorite nights. So next movie night, I want to see that lecture room absolutely full. 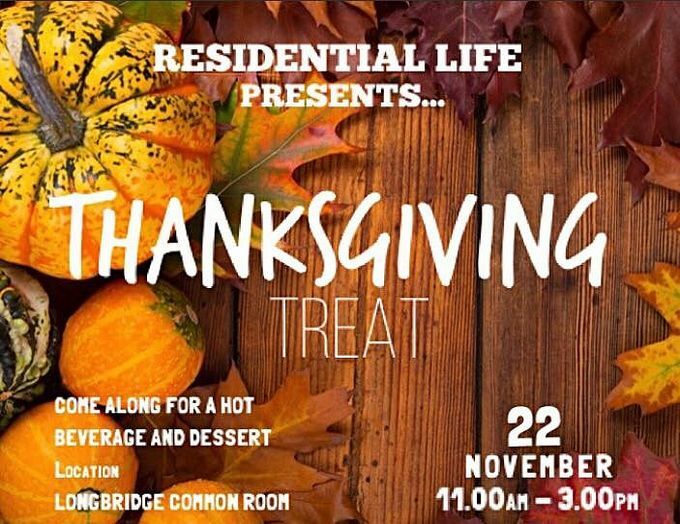 Now to end the week, we had Residential Life Scholars Muhamed Badjie and Keila Cabral doing a Thanksgiving in the new Longbridge common room. Being far away from home, a lot of North American students and myself really appreciated the chance to celebrate Thanksgiving even though we are far from our families. But at the same time, it shows that we have our own family here at UEL. It was great as we had students from all around the world celebrating this amazing day with us. The food was to die for. Students brought their own desserts, we all played some games and just had a good time. As always, I just want to remind you guys to come and join our social media pages. You will always be up to date on all upcoming events, or you can just leave some suggestions on what you would like to see more from us. Your feedback really helps us to improve the campus for you. If you haven’t joined any of our social media yet, all the links are listed below. Well UEL, as always it is my pleasure to update you guys on what is going on but I have to go. I will see you next week. Much love!